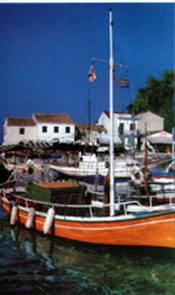 The quaint fishing village of Loggos is popular with lovers of good food and fresh fish. 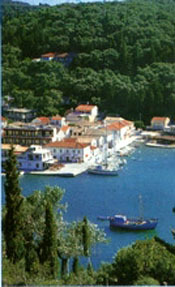 The picturesque capital Gaios provides for a lovely and safe harbour that can accommodate up to 200 yachts. The smallest of the Ionian islands, only 13 kilometres long and four wide, Paxi is located 32 miles south of Corfu and 12 miles off the coast of Epirus on the mainland. A peaceful and quiet island, ideal for relaxing vacations, it has a mild climate with pleasant winters, while summers are cool with temperatures never exceeding 40� C, even on the hottest days. Administratively, the island of Paxi belongs to the prefecture of Corfu together with its neighbouring islets of Antipaxi in the south, inhabited only by a few fishermen and shepherds. According to mythology, Neptune created Paxi by tearing off a piece from Corfu with his trident, when he, madly in love with Amphitrite, was looking for a quiet place to take her. The island was known to the Phoenicians and according to tradition it borrowed its name from the Phoenician word "pax", which means slate. Blessed with a fascinating landscape combining magnificent, crystal-clear pebble and sandy beaches, impressive white boulders, steep cliffs punctuated by grottos accessible only by boat, snaking limestone walls and dense olive groves, this tiny island could accurately be described as a symphony in green and blue. Inland paths lead to small villages tucked away off the beaten path, lush nature dotted with old chapels, abandoned olive presses, deserted windmills, wells, mansions and majestic scenery. In April and May, the island is transformed into an oasis of colour with many springtime flowers in full bloom, deep-red poppies, yellow and purple freesia, pastel coloured orchids, and flora and fauna adding to the beauty of the ancient olive trees, citrus trees, cypress and pine. Built on a wide charming bay on the east side of the island, the picturesque capital Gaios provides for a lovely and safe harbour, quite impressive with a natural fjord created at its entrance by the islets of Panagia, the site of its namesake monastery, and Aghios Nikolaos crowned by a 15th century Venetian castle and a windmill of the same period standing next to it. Boasting facilities that can accommodate a large number of craft, the small port-capital comes alive during the summer months with visitors arriving by sea on chartered yachts, ferries and motor cruisers. It was named after one of Apostle Paul's students who was the first to introduce Christianity to the island. The Culture Society Museum in Gaios is worth a visit. The nearby beaches of Monodendri and Haramis are beckoning with crystal-clear waters, while the neighbouring sands of Arkoudaki, Orko and Lakko can be reached only by caique. In the north, the seaside village of Laka is built on a beautiful bay clad with olive trees and pines. On the west coast of Paxi, one of the most picturesque sites, Cape Erimitis, enchants visitors with its crystal-blue waters creating an astonishing iridescence rivalled by the nearby impressive rock formations. On the southwestern part of the island, a series of caves are gathered within a 5-kilometre area. The size of the caves varies, but they all feature large, arched "gates" beckoning visitors to navigate through them by boat. The idyllic deserted islet of Mogonissi lies southeast of Gaios, with the small chapel of Aghios Spyridon standing in solitude, amidst lush vegetation. The surrounding area provides for a scenery of unique beauty with rocks standing in striking formations rising up from the turquoise waters. The islet can be reached by fishing boat from the capital. The islands of Panagia, Mogonissi and Antipaxi can be reached by hovercraft. Held early in September at Gaios, Lakka and Loggos, the Paxos Chambers Music Festival features the works of prize winning and scholarship students from all over Europe. Organised by the Paxos Festival Trust, it provides much pleasure to holidaymakers and locals alike, at the same time offering young musicians a valuable experience in public performance. The concerts are attended by well known personalities from the world of music, who act as art directors for the Festival. The Paxiots make their living from olive picking, fishing and in recent years, tourism. Paxi boasts a variety of comfortable accommodations, hotels, bungalows, furnished flats, pensions, rooms and campsites, while traditional tavernas and restaurants can be found in a number of places throughout the island. There are also mini-markets and shops selling from fresh bread to clothes, jewellery, souvenirs, fishing equipment and locally produced top quality olive-oil and honey. The hospitality of the locals, the abundant fresh fish, the lively night-life for those who seek it, the peaceful, quiet countryside for lovers of solitude and tranquillity, combine to make Paxi the ideal place for unforgettable holidays. From Athens, Paxi can be reached by bus to Igoumenitsa and from there by a one-hour ferryboat ride to Gaios. There is also a year-round ferryboat service from the Peloponnesean port-city of Patras to Gaios, and the trip lasts 4.5 hours.